On Monday, I took an early look at my imaginary AL Cy Young ballot and I have to admit that it doesn't look that good after Lee and Weaver got rocked. There's still plenty of time for things to change and I'm afraid if CC Sabathia wins 20 some odd games he will undeservedly win. Derwood recently told me that we tend to write more about players' failures than successes. While I was researching this post, I realized he might be on to something. Just four days after writing about the best pitchers in the American League, I really wanted to write about the worst. We can't help it. We're the baseball blog version of Nelson Muntz. So this is how I'd vote if I had a ballot for worst pitcher in the AL. A reverse Cy Young, if you will. And I actually have no idea what any of their records are because wins and losses are useless for pitchers. 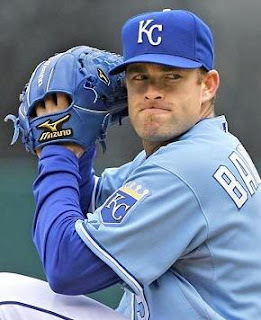 I feel bad for Banny but if it's any consolation the second worst pitcher in the AL isn't too far back. Bannister is one of the few players who actively studies sabermetrics. Unfortunately, there isn't a metric out there that makes him look like a good pitcher. I mean, he's better than you but you're not actually the picture of fitness. Instead of trying to construct your own KFC Skinwich, why don't you try doing a couple of situps? What was I talking about? Banny's WAR is 0.0 making him essentially a replacement player. Which at $2.3 million, is way too much for the Royals to be paying him. He has the highest ERA in the AL at 5.95 while his 4.83 xFIP suggests he isn't as terrible as his ERA implies. Good old Yuni Betencourt sure does work wonders at short, huh? Banny's 1.60 K/BB ratio isn't doing him any favors either. Davis might not look like the second worst pitcher in the AL at first glance with a 4.45 ERA. But he has the second highest xFIP (4.98), second lowest WAR (0.1) and second lowest +WPA (8.72). His BABIP (2.80) is nearly 20 points lower than his lowest projection (2.99 from CHONE and DiPS) which means he's been bad and lucky this year. The 1.60 K/BB is at Brian Bannister levels of mediocrity. Time to rejoice Royals fans, 2 of your player made it on my ballot. Davies has the highest xFIP (5.01) to go with his 5.22 ERA. His 3.08 BABIP and 1.41 K/BB are right in line with his projections. He is basically 1 win better than a replacement player. I tried to see if Feldman's hitter friendly home field hurt his numbers but his HR/9 and xFIP are both better in Arlington than on the road. Even his BABIP at home is higher than on the road suggesting he's been unlucky there too. He's sporting a 5.44 ERA and a 4.85 xFIP with a 1.66 K/BB. There are more players with a lower WAR than him (1.20) but this is my ballot. Derwood is right. It does feel good to point out the shortcomings of others from behind the keyboard and on my couch. And by couch, I mean milk crate. Can you please put Josh Beckett on this list? The guy's a bum. Would if I could, Bob. Beckett, as terrible as he's been, hasn't pitched enough innings to qualify for regular season awards, even if I made them up.